I taught my last workshop at Stampaway on Friday afternoon. This is a whimsical journal and a perfect way to end a full, and busy, three days of teaching. I am so honored to have been an instructor! It was a wonderful experience. journal and accented it with charming antique gold colored beads. This lattice stitch might remind you of an old fashioned trellis with a butterfly perched between two flowers. This 4 1/4” x 5 3/4” journal has 48 pages divided into two sections. My Thursday at Stampaway was busy! This was my second workshop, and one of the most popular that I taught. 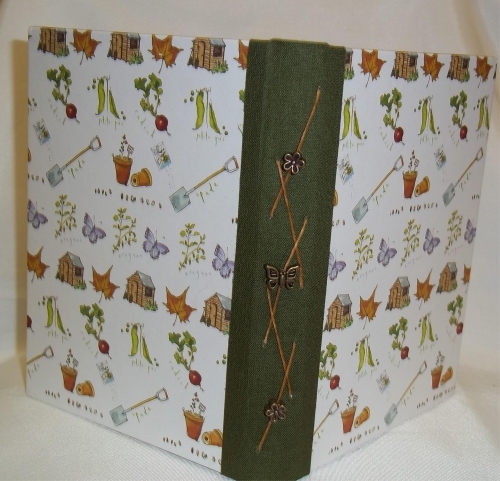 It is a lovely binding! 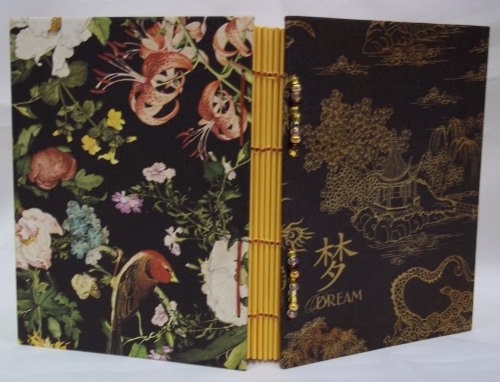 Lovely “Birdsong” paper by Graphic 45 covers this journal that is bound with an interesting and ancient Japanese binding. We used Czech glass beads and Irish waxed linen to bind this 4 1/2” x 6”, 5 section journal. This 11th century Japanese binding is also called a double span-span, span-span sewing. In bookbinding, the term “span” refers to a sewing where the thread climbs directly into the station or section above without linking into the section below (as in the Coptic stitch, for example). Usually this sewing is not used for a book with a hard cover. Using a hard cover for our books and adding beads and trim to the book made our journals a contemporary interpretation of an ancient binding. Because this sewing is a “span” sewing, there is a little “wobble” in the finished book. Think of this as part of it’s charm. This is actually a very tight, sturdy sewing and I love the beauty of it’s simplicity. I began the second day of workshops at Stampaway teaching a Zentangle ® class. 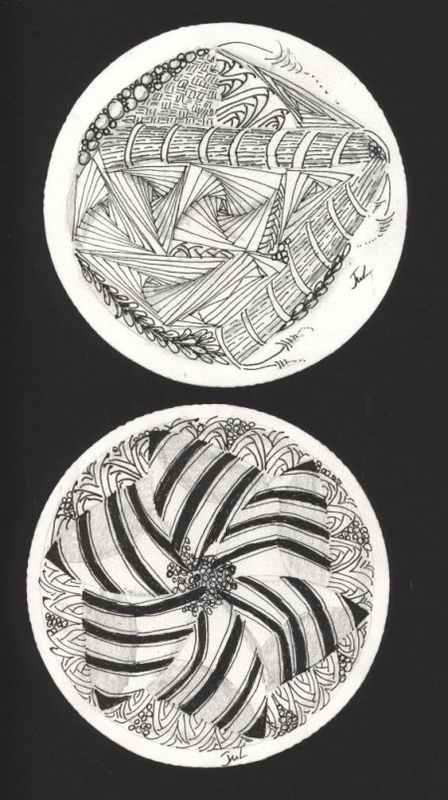 I am a Certified Zentangle ® Teacher, trained in the fourth group by Rick Roberts and Maria Thomas. In this workshop we explored the basics of Zentangle ® using the new round Zentangle ® tiles. We learned the basics of Zentangle ®, a few basic tangles and a couple of more challenging ones. Zentangle ® is for anyone who would like to try something new and different. Zentangle ® is fun, relaxing and suitable for everyone. Even if you think you can’t draw, you CAN create beautiful Zentangles. I was honored to teach this workshop on the first day of workshops at Stampaway 2013, Wednesday, August 7. Every journal made in this workshop was a one of a kind! How fun is that? Participants selected their cover paper from a wide variety of choices of beautiful screenprint paper made in Napal to create a 5 3/4” X 8 3/4”, 3 section, 48 page journal with an Italian book cloth spine. 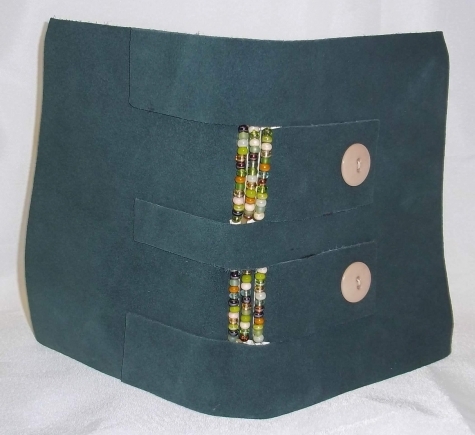 We used two colors of Irish waxed linen for the chain stitch binding. The chain stitch is an elegant and versatile binding that every bookbinder should know. There is debate whether the Italian Cross Structure binding is a historical model or a contemporary creation inspired by study of a historical long stitch model. The Italian bookbinder, Carmencho Arregui, is credited with either its creation or re-discovery. You can explore the website, www. 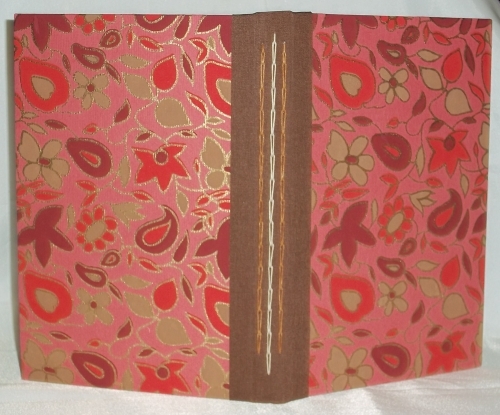 outof binding.com and see the work of this bookbinder and pictures of his 1992 Cross Structure binding. Arregui has developed four or five more complex Cross Structure bindings, as well. The structure we created in this workshop is a simple model.